This week’s amateur football saw Campsie Black Watch continue their successful return to the game with an excellent win over Possil. But there were mixed fortunes for Harestanes with a win and a defeat from their Foster’s Central Scottish AFL matches. Campsie Black Watch/Waterside achieved an outstanding 2-1 over Possil at Milton. In atrocious conditions in a nonstop deluge of rain the new amateur side were magnificent against a Possil side full of talent as they showed they are growing in stature with every game. Play was end to end in the opening half, Possil always a threat but outmanoeuvred by a brilliant Campsie defence. Watch went ahead in the 40th minute when keeper Roy elected to play a short pass out to defender Maxwell, Midfield player Harty’s challenge on the defender was successful and quickly rolled the ball into the net. Possil made the running after the interval but the backs to the wall defending was superb from Watch defenders Wilson, Gourlay, Baikie, Horne and Hardy. The goal that Campsie badly needed came in the 70th minute as Fitzpatrick raced past full-back Boyd on the right and his cross to the back post saw Horne on the spot to net. Possil tried everything they knew and Connor finally gave Possil their opening they were expecting to get earlier, a long ball from Boyle beat the keeper Wilson. There was a further opportunity for Watch in the 83rd minute when Corr was pulled down in the box by a home defender but the keeper saved Hardie’s spot kick. This was a benchmark for the Campsie team but every player rose to the challenge from a quality side and came through with a result that was outstanding. Campsie met a very strong home team that threatened to over run them in the opening half at Stirling University. But an outstanding second half with two goals from Steven Aitken and one from Garry Pettigrew looked to have the points in the bag for Campsie. But a Dunblane goal two minutes from time saw the points shared. Harestanes put in an excellent performance at Drumchapel on Wednesday night to secure the points with a goal from Proctor. A week of mixed fortunes for Harestanes was rounded off at Cambusnethan on Saturday with a performance that did not gel with the high level of their two previous games. Harestanes came close to taking an early lead when a free-kick from Fitzsimmons brought a diving stop by the keeper. He could only palm out but Proctor’s effort hit the outside of the post. A shot by Munn was then put out for a corner by the keeper but it was Cambusnethan who took the lead from a long ball up the park when, despite Hares claims for offside, their forward was allowed to lob the ball into the net. Harestanes equalised when, with the ball bobbing around the box, Proctor got a touch and forced the ball in. Fitzsimmons had a good heading chance to put Harestanes ahead but could only go wide. Cambusnethan were unlucky not to take the lead early in the second half with a shot which cracked off the underside of the bar and came out. But they did go ahead from a quickly taken free kick which caught Harestanes unprepared. Only Proctor reacted but could only help the ball in. Harestanes’ response reeked of frustration as they struggled against a home side eager for victory. The closest they came to an equaliser was a shot by Cawley that went inches wide. Harestanes Tote - no winner, £50 rollover. Harestanes United faced an away trip to Dollar Glen aiming to bounce back from a disappointing midweek defeat by Gormac Thistle. Harestanes started brightly with the attack linking well and in the ninth minute Salim Kouider-Aissa flicked the ball into Ben Mayo who played in Jamie Dunn who forced a great double save from Ian Macnab in goals. However in the 17th minute Dollar Glen took the lead when the Harestanes defence fell asleep at a long free-kick which saw Gary Clarke’s header loop over the stranded Ross Whitelaw in goals. Harestanes replied in the 29th minute when Kouider-Aissa scored his first for the club with a low free kick past Macnab’s near post from 25 yards. Harestanes came out in the second half full of energy and four minutes after the interval Ryan McCormack passed to Kouider-Aissa who cut in from the left and hit a bullet into the top corner from outside the area. In the 55th minute Harestanes extended their lead when Josh Hunter scored from Dunn’s inswinging corner. Dollar Glen replied in the 62nd minute when Louis Caine dribbled past two defenders and looped the ball over Whitelaw in the Harestanes goal. Low numbers forced coaches Craig Beveridge and Aidan Moore into second half cameo appearances with Moore justifying the decision when he struck Mayo’s lay-off into the roof of the net from 25 yards. In the 80th minute Beveridge took a short corner to captain David Barrie and he passed to Kouider-Aissa who rocketed the ball into the top corner from 30 yards to get his hat-trick and seal the 5-2 victory for United. Despite the scoreline Lenzie competed well against one of the league’s stronger sides in this CSFA League Cup match. Lenzie started playing up the Boghead slope so were under pressure but good defending and excellent goalkeeping kept them in the game. Getting a goal back just on half-time from a well taken Lewis Gargano free-kick gave them a chance going into the second half just 3-1 down. However the pacey Stirling side were difficult to close down and as Lenzie tired they created more goals as they dominated in midfield. 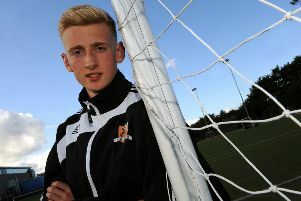 Lenzie will not play many teams of this calibre during this season and the performance of the defenders and the ability of their twin strikers Ewan Stevenson and Lewis Gargano and referee’s man of the match Dylan Watton suggest that, once Lenzie play at their own level, they should have a good season. Lenzie YC under-16s went down 3-2 to Bellshill Athletic in their Cumbernauld, Kilsyth & District Youth League League Cup group match. It was a big occasion for the new Bellshill Athletic 2001s who were making their competitive debut today after transferring the team over from Cleland BC 2001s. However they started off slowly and Lenzie took full advantage, finishing their chances to go two up in 17 minutes. The home side slowly began to make an impact and reduced the deficit just before half-time when Lewis Allan found himself free at the back post to control and convert a good cross from David Fagan. Bellshill levelled after the break when Rory Wallace sent a through ball into the path of Connor Phairs who fires home. Lenzie cleared a Bellshill effort off the line but Phairs got the winner when he beat three men before firing home a powerful shot. Foster’s Central Scottish AFL: Premier Division - Campsie Minerva v Eastfield; Harestanes v Bannockburn. Division 1A - Campsie Black Watch Waterside v Blantyre Celtic. RJM Sports Stirling & District League: Division 1B League Cup - Westfield v Campsie. Division 2 League Cup - Harestanes United v Forth Thistle. Foster’s Central Scottish AFL: Premier Division - Harestanes v Campsie Minerva; JB Tyres Bunrigh Trophy Round 2 - Clydebank v Campsie Black Watch Waterside. Caledonian League: Premier Division - Glasgow Harp v St Mungo’s. RJM Sports Stirling & District League: Division 1B League Cup - Condorrat v Campsie. Division 2 League Cup - Harestanes United v Greentree.